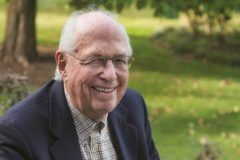 John K. Notz Jr. ’49 of Chicago was awarded the 2018 Preservation Hero Award by the Library of American Landscape History. The award celebrates Notz’s decades of commitment to the study of preservation of American landscapes. It was given in recognition of Notz’s indefatigable research into the origins of designed landscapes in the Chicago region and his enthusiastic support of historic landscape scholarship nationwide.